Dinosaurs is an American family sitcom comedy television series that was originally broadcast on ABC from April 26, 1991 to October 19, 1994. 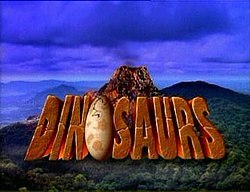 The show, about a family of anthropomorphic dinosaurs (portrayed by puppets), was produced by Michael Jacobs Productions and Jim Henson Television in association with Walt Disney Television and distributed by Buena Vista International, Inc. The characters were designed by Henson team member Kirk Thatcher, the series is set in an alternate history in which dinosaurs never became extinct. News stories written at the time of the show's premiere highlighted Dinosaurs' connection to Jim Henson, who died the year before. Henson conceived the show in 1988, according to an article in The New York Times, adding he wanted it to be a sitcom, but about a family of dinosaurs. Until the success of The Simpsons, according to Alex Rockwell, a vice president of the Henson organization, "people thought it was a crazy idea." In the late 1980s, Henson worked with William Stout, a fantasy artist, illustrator and designer, on a feature film starring animatronic dinosaurs with the working title of The Natural History Project; a 1993 article in The New Yorker said that Henson continued to work on a dinosaur project (presumably the Dinosaurs concept) until the "last months of his life." The television division of The Walt Disney Company began working on the series in 1990 for CBS before the series landed on ABC, which Disney eventually acquired. Dinosaurs is initially set in the alternate 60,000,003 BC in Pangaea. The show centers on the Sinclair family: Earl Sinclair (the father), Fran Sinclair (Phillips - the mother ), their three children (son Robbie, daughter Charlene, and infant, Baby Sinclair) and Fran's mother, Ethyl. Earl's job is to push over trees for the Wesayso Corporation with his friend and coworker Roy Hess where they work under the supervision of their boss Bradley P. Richfield. The focus of the show's plot is the Sinclair family: Earl, Fran, Robbie, Charlene, Baby, and Ethyl. Character and family names throughout the series often referred to petroleum companies and/or petroleum products. For example: Sinclair, Phillips, Hess, B.P., Richfield, and Ethyl, among others. Mak Wilson (Seasons 2–4) Megalosaurus The patriarch of the Sinclair family, Earl is the protagonist. He is a Megalosaurus and is depicted as being thick-headed and suggestible. Earl works as a Tree Pusher at the WESAYSO Development Corporation. Pons Maar (occasionally) Allan Trautman Allosaurus The mother and homemaker of the Sinclair family. Fran is mentioned on the show as being an Allosaurus. Her four fins and wrists make her resemble a Dilophosaurus as well. On rare occasions, Fran wears fuzzy house slippers. Earl affectionately calls his wife "Frannie". Julianne Buescher (eyes) Hypsilophodon Earl and Fran's son and oldest child, he is a Hypsilophodon. Robbie stands out with his red varsity jacket and bright red sneakers. Arlene Lorre (Season 1, episode 1 only) Bruce Lanoil Protoceratops Earl and Fran's daughter and middle child, she is a Protoceratops. Charlene stands out by wearing sweaters, necklaces, and earrings. John Kennedy (eyes) Megalosaurus Earl and Fran's son and youngest child, he is a Megalosaurus as stated by Earl. In the episode "Out of the Frying Pan," Baby is shown as a Ceratosaurus. His legal name is Baby Sinclair, which was given to him by the Chief Elder. Baby is sarcastic and wisecracking. His favorite thing to do is to hit Earl on the head with a frying pan. His catch phrases are "I'm the baby. Gotta love me." and "Not the mama!". Earl will often call his youngest son "Junior". Julianne Buescher (face, occasionally) Edmontonia Ethyl is an Edmontonia who is Fran's mother, Earl's mother-in-law, and the maternal grandmother of Robbie, Charlene, and Baby. Ethyl comes to live with the Sinclairs, and is revealed to have a son named Stan (Fran's brother). Ethyl always wears house slippers and is wheel chair bound. Ethyl enjoys making fun of Earl and hitting him with her cane. Julianne Buescher (arms) David Greenaway Tyrannosaurus rex Roy is Earl's co-worker at the WESAYSO Development Corporation and best friend. He is a dull witted Tyrannosaurus rex who also has a brother named Roy. Rob Mills (occasionally) Triceratops B.P. Richfield is Earl, Roy, Ralph, Gus, and Sid's heartless boss at the WESAYSO Development Corporation where he oversees the Tree Pushers. He is a Triceratops, with the horns on the frill making him look like a Styracosaurus. In "Hungry for Love," it is revealed that Mr. Richfield has a daughter named Wendy. Monica Zariahanna Devertebrae Suzie Plakson n/a Julianne Buescher Brontosaurus A Brontosaurus and Fran's best friend who is the only four-legged dinosaur on the show. She is usually seen from the neck up where it took up to three to four people to operate the neck and head. Spike Christopher Meloni David Greenaway N/A Polacanthus He is a semi regular character who resembles a Polacanthus with a bandana, a black leather jacket, and biker boots. Spike is Robbie's best friend who often refers to him as "Scooter." Ralph Quincy Needlenose Various Various Various Troodon A Troodon who is a co-worker of Earl and Roy at the WESAYSO Development Corporation. The Full-Bodied costume used for Ralph is often used for one-appearance minor characters. Gustav Joseph "Gus" Spikebake Various Various Various Ceratosaurus A Ceratosaurus who is a co-worker of Earl and Roy at the WESAYSO Development Corporation. The Full-Bodied costume used for Gus is often used for one-appearance minor characters. Sidney Tiberius "Sid" Turtlepuss Michelan Sisti John Kennedy Michelan Sisti Psittacosaurus A Psittacosaurus who is a co-worker of Earl and Roy at the WESAYSO Development Corporation. Sid is seen more than the other characters. He enjoys bagels and donuts. The Full-Bodied costume used for Sid is often used for one-appearance minor characters. Tom Fisher (later appearances) Allan Trautman Troodon A bespectacled Troodon who is Robbie, Charlene, Mindy, and Spike's teacher at Bob LaBrea High School. The Full-Bodied costume used for Mr. Pulman is often used for one-appearance minor characters. One green-skinned character named Mindy only appeared in "Slave to Fashion." A brown-skinned character also named Mindy appeared in "Charlene & Her Amazing Humans" and "Scent of a Reptile." Howard W. Handupme Kevin Clash N/A N/A Pachycephalosaurus A Walter Cronkite-esque Pachycephalosaurus who is the newscaster for DNN (short for Dinosaur News Network) which is a spoof of CNN. He is one of a few characters that isn't a Full-Bodied character. The first Chief Elder appeared in the two-part episode "Nuts to War" where he was a Protoceratops. He was performed by Steve Whitmire and voiced by George Gaynes. The Dryptosaurus Chief Elder who died in the episode "And the Winner Is..." is voiced by Sam McMurray and was succeeded by political analyst Edward R. Hero (performed by Allan Trautman and voiced by Jason Bernard). He was about to name Baby Sinclair, but he was dying with the Stegosaurus name announcer thinking the Chief Elder named Baby "Aagh Aagh I'm Dying You Idiot Sinclair". This was the only Chief Elder that was a Full-Bodied character. A suited Chief Elder that appeared in "Green Card" is performed by Mak Wilson and voiced by Joe Flaherty. The Chief Elder that appeared in "The Greatest Story Never Sold" is performed by Allan Trautman and voiced by Tim Curry. The Chief Elder that appeared in "The Golden Child" is voiced by Michael Dorn. The Chief Elder that appeared in "Working Girl" is performed by Allan Trautman and voiced by Joe Flaherty. Mr. Lizard Allan Trautman N/A N/A Iguanodon Mr. Lizard is a gray Iguanodon who is the star of Baby's favorite TV show "Ask Mr. Lizard" (a parody of the television show Watch Mr. Wizard). His show helpfully taught generations of children about science that was vaguely related to scientific principles, but mostly existed as a way of ridding the world of young dinosaurs named Timmy. After the often violent death of his assistant, Mr. Lizard would cheerfully call off camera "We're going to need another Timmy!" Garrison "Gary" Steve Landesberg N/A N/A Dilophosaurus Gary is a 50 ft. Dilophosaurus dinosaur whose feet can only be seen. He appeared in the Dinosaurs episode "High Noon". He takes a romantic interest in Fran, and challenges Earl for her. Henri Charles Poupon Tim Curry Allan Trautman (puppeteer) N/A Archaeopteryx Henri Poupon is an Archaeopteryx appeared in the Dinosaurs episode "Getting to Know You." Henri is the father of Francois Poupon and husband of Simone Poupon. The Poupons are a family of birds who come from an unnamed country, clearly based on France. Henri is irritated by exchange student Charlene Sinclair. He is disappointed by the consumption of his own son, but feels that a big screen TV would help the healing process. Blarnarbus "Blarney" Steve Whitmire Steve Whitmire Steve Whitmire Deinonychus Blarney is a red Deinonychus hand-puppet character on Dinosaurs, intended as a spoof of Barney the Dinosaur. He appeared in Dinosaur TV segments in two fourth-season episodes -- "Terrible Twos" and "Into the Woods." Blarney is adored by young children but is less popular with older viewers. He appears on videotapes released as part of the Blarney Home Video Library. Parents who order will "get a new video delivered to their child every hour for the next decade." Titles spoof not only the Barney franchise, but other commercials for mail-order videos, from fitness and health tapes to bridge, computers, and semi-religious quests. Georgie Allan Trautman (normal voice), Edward Asner (evil voice) Jack Tate Allan Trautman European hippopotamus Georgie is a dinosaur dressed as a full bodied European hippopotamus. He is a children's TV icon who appeared in the Dinosaurs episode "Georgie Must Die." An obvious spoof of the Barney the Dinosaur. Georgie is actually a megalomaniac planning to take over the world through his financial empire and the devotion of the dinosaur children. After Earl was arrested for impersonating Georgie, Fran invited Georgie down to the police department to clear things up where he showed off his bad side when alone with Earl while stating that he was not pleased with Earl posing as him. Later that night, Earl learned about his motives from Jean-Claude and Brigitte upon them springing Earl from the police department. Earl later fought Georgie on his television show and ended up defeating him. During the credits, Howard Handupme reported that Georgie was arrested for tax evasion and racketeering following an investigation from what happened on his TV show. It was also mentioned that the Chief Elder has pardoned Earl of his crime of posing as Georgie and gave him the Key to the City. Roy ended up taking his place on TV as the eponymous "Uncle Roy." Outside of the recurring characters, there are a group of dinosaur characters called Unisaurs. They are customizable dinosaur characters similar to the Whatnots from The Muppet Show and the Anything Muppets from Sesame Street. Some of the Unisaurs are Full-Bodied while the others are hand-puppets. They come in different types. Ansel from the episode "Driving Miss Ethyl". His face was performed by Julianne Buescher, his body was performed by Pons Maar, and voice was provided by Michael McKean. The Babysitter from the episode "Terrible Twos". His face was performed by Bruce Lanoil, his body was performed by Tom Fisher, and voice was provided by John Glover. Buddy Glimmer from the episode "Family Challenge". His face was provided by David Greenaway, his body performed by Jack Tate, and his voice was provided by Sam McMurray. The Devil from the episode "Life in the Faust Lane". His face was performed by Bruce Lanoil, his body was performed by Pons Maar, and his voice was provided by Tim Curry. Dr. Ficus from the episode "Germ Warfare". His face was performed by Bruce Lanoil, his body was performed by Pons Maar, and his voice was provided by Charles Kimbrough. Ed from the episode "Scent of a Reptile". His face was performed by David Greenaway, his body was performed by Jack Tate, and his voice provided by Thom Sharp. Mel Luster from the episode "The Mating Dance". His face was performed by Bruce Lanoil, his body was performed by Jack Tate, and his voice was provided by Richard Portnow. Walter Sternhagen from the episode "The Discovery". His face was performed by Bruce Lanoil, his body was performed by Pons Maar, and his voice was provided by Thom Sharp. The Doctor from the episode "Golden Child". His face was performed by David Greenaway, his body was performed by Tom Fisher, and his voice was provided by Sam McMurray. Glenda Molehill from the episode "Switched at Birth". Her face was performed by Bruce Lanoil, her body was performed by Tom Fisher, and her voice was provided by Mimi Kennedy. Heather Worthington from the episode "A Slave to Fashion". Her face was performed by Terri Hardin, her body was performed by Tom Fisher, and her voice was provided by Julia Louis-Dreyfus. Al "Sexual" Harris from the episode "What "Sexual" Harris Meant". His face performed by Bruce Lanoil, body performed by Jack Tate, and voice provided by Jason Alexander. Bob the DMV Worker from the episode "Unmarried...With Children". His face was performed by David Greenaway, his body was performed by Jack Tate, and his voice was provided by David Wohl. Gus Molehill from the episode "Switched at Birth". His face was performed by David Greenaway, his body was performed by Jack Tate, and his voice was provided by Jason Alexander. The Job Wizard from "Career Opportunities." His face was performed by David Greenaway, his body was performed by Jack Tate, and his voice was provided by Jason Alexander. The Clerk from the episode "The Son Also Rises". His face was performed by Bruce Lanoil, his body was performed by Jody St. Michael, and his voice was provided by Robert Picardo. The Dinosaur Chief from the episode "Hurling Day". His face was performed by Kevin Clash, his body was performed by Michelan Sisti, and his voice provided by Harold Gould. The Folk Singer from the episode "I Never Ate My Father". His face was performed by John Kennedy, his body was performed by Michelan Sisti, and his voice was provided by Steven Banks. Frank from the episode "Fran Live". His body was performed by Michelan Sisti and his voice was provided by Thom Sharp. General H. Norman Conquest from the episode "Nuts to War". His face was performed by John Kennedy, his body was performed by Michelan Sisti, and his voice was provided by Jason Alexander. The Insurance Agent from the episode "Family Challenge". His face was performed by Bruce Lanoil, his body was performed by Jack Tate, and his voice was provided by Peter Bonerz. Jean-Claude from the episode "Georgie Must Die". His face was performed by David Greenaway, his body was performed by Michelan Sisti, and his voice was provided by Tim Curry. Mr. Myman from the episode "Out of the Frying Pan". His face was performed by David Greenaway, his body was performed by Leif Tilden, and his voice was provided by Michael McKean. The Muse from the episode "Charlene's Flat World". His face was performed by John Kennedy, his body was performed by Jack Tate, and his voice was provided by Robert Picardo. Officer Bettelheim from the episode "License to Parent". His face was performed by David Greenaway, his body was performed by Michelan Sisti, and voice was provided by Michael McKean. The Odd Job Dinosaur from the episode "How to Pick Up Girls". UFO Host from the episode "We Are Not Alone". His face was performed by Bruce Lanoil, his body was performed by Michelan Sisti, and his voice was provided by Jason Alexander. Zabar from the episode "Germ Warfare." His face was performed by David Greenaway, his body was performed by Michelan Sisti, and his voice was provided by Dan Castellaneta. Caroline Foxworth from the episodes "How to Pick Up Girls" and "Steroids to Heaven". Her face was performed by Julianne Buescher, her body was performed by Star Townsend, and her voice was provided by Julianne Buescher. Thighs of Thunder from the episode "The Discovery". Her face was performed by Julianne Buescher, her body was performed by Star Townsend, and her voice provided by Suzie Plakson. Wendy Richfield from the episode "Hungry for Love". Her face was performed by Julianne Buescher, her body was performed by Michelan Sisti, and her voice was provided by Wendie Jo Sperber). Unnamed Female Light Green Unisaur Dryosaurus A female Dryosaurus with a short snout, eyelashes, hair-like three crest. Harold Heffer from the episode "What "Sexual" Harris Meant". He was performed by Bruce Lanoil and voiced by Jack Harrell. Elder #2 from the episode "Charlene's Flat World". Judge D. X. Machina from the episode "Earl's Big Jackpot". He was performed by Bruce Lanoil. Shopper from the episode "Power Erupts." Frilled green dinosaur Leptoceratops A green Leptoceratops with a large muzzle that was used for various characters. Sometimes has horns to make it look like a Triceratops. Dr. Elliot Piaget from the episode "Terrible Twos". He was performed by Allan Trautman. Edward R. Hero from "And the Winner Is..." He was performed by Allan Trautman and voiced by Jason Bernard. Grandpa Louie from the episode "The Last Temptation of Ethyl". He was performed by Allan Trautman and voiced by Buddy Hackett. Judge H.T. Stone from the episode "Charlene's Flat World". He was performed by Steve Whitmire and voiced by Paxton Whitehead. Mr. Ashland from the episode "Power Erupts". He was performed by Kevin Clash and voiced by John Vernon. Mr. Mason Dixon from the episode "What "Sexual" Harris Meant". He was performed by Steve Whitmire. Winston from the episode "Earl's Big Jackpot". He was performed by Allan Trautman and voiced by Tim Curry. Gray Iguanodon-faced dinosaur Iguanodon That was often used for Mr. Lizard and other background appearances. Cleft-chinned Albertosaurus-esque dinosaur Albertosaurus That was often used for Captain Action Figure, various newscasters, and various reporters. Timmy-type Mussaurus A child Unisaur that was often used for Timmy in the "Ask Mr. Lizard" TV show. Two variations of this Unisaur existed: a green one and a blue one. Richard Simmons Dinosaur from the episode "Nature Calls". He was performed by Steve Whitmire and voiced by Richard Simmons. A female version of it was used for a Sitcom Wife in the episode "Dirty Dancin'". He was performed by Julianne Buescher and voiced by Jessica Lundy. Brown needlenose Coelophysis A brown puppet version of a Needlenose that was used for Mr. Otto Lynch from "What "Sexual" Harris Meant" (performed by Allan Trautman). The Caroler from "Refrigerator Day". Government Clerk from the episode "And the Winner Is..."
Newsboy from the episode "Charlene's Flat World". USO Soldier from the episode "Nuts to War" Pt. 2. The Stegosaurus puppet was also used several times as a student at Bob LaBrea High School. The Guy in a Labcoat from the episode "Charlene's Flat World"
The Jury Foreman from the episode "Earl's Big Jackpot"
Parasaurolophus Parasaurolophus The Parasaurolophus puppet was often used for female characters starting in "Slave to Fashion." Velociraptor Velociraptor The Velociraptor puppet was used in the final season. Topical issues featured in Dinosaurs include environmentalism, endangered species, women's rights, sexual harassment, LGBT rights, objectification of women, censorship, civil rights, body image, steroid use, allusions to masturbation (in the form of Robbie doing the solo mating dance), drug abuse, racism (in the form of a dispute between the two-legged dinosaurs and the four-legged dinosaurs), peer pressure, rights of indigenous peoples (in the form of the dinosaurs interacting with cavepeople), corporate crime, government interference in parenting, and pacifism. In the episode "I Never Ate for My Father," in lieu of carnivorism, Robbie chooses to eat vegetables, and the other characters liken this to communism, and drug abuse. In the final season, "The Greatest Story Ever Sold" (a take off of The Greatest Story Ever Told) references religion when the Sinclair family becomes eager to learn the meaning of their existence. The Elders dictate a new system of beliefs, and the entire cast (with the exception of Robbie) abandons science to blindly follow the newly popular "Potato-ism". Another religious-themed episode was "The Last Temptation of Ethyl," in which Ethyl willingly allows a televangelist to exploit her near-death experience to extort money from followers. She backs out after having a second such experience, where instead of heaven, she experiences a "place not so nice": an existence surrounded by nothing but multiple Earl Sinclairs. Several jokes in the series were at the expense of television shows in general. Earl often wants to watch TV rather than do something more practical, and several jokes accuse television of "dumbing down" the population and making it lazy. Captain Action Figure shows up in children's programming that Fran mistakes for a commercial. Whenever Captain Action Figure mentions a product, the screen flashes "Tell Mommy I WANT THAT!". Before the appearance of Georgie, Dinosaurs used a puppet reminiscent of Barney the Dinosaur named "Blarney" in two episodes. During his appearances, members of the Sinclair family commented on his annoying characteristics and failure to teach anything to children. The characters will sometimes break the fourth wall as well, especially Baby. An example of such is seen in the episode "Nature Calls" (Season 3, Episode 1) when Fran and Earl spell out words in front of Baby during an argument, who, after looking at the camera and saying "This could get ugly", proceeds to spell out "They think I can't spell" with his alphabet blocks. The series finale of Dinosaurs, titled "Changing Nature", depicts the irresponsible actions of the dinosaurs toward their environment, and the ensuing Ice Age which leads to their demise. In the episode, a swarm of Bunch Beetles are unable to show up and devour a form of creeper vine. Charlene discovers that WESAYSO has constructed a wax fruit factory called FruitCo on the swampland that serves as the Bunch Beetles' breeding grounds, causing the extinction of the species (save for one male named Stan). Fearing a public relations fiasco more than any environmental threat, WESAYSO quickly puts Earl in charge of an attempt to destroy the vines, which have grown out of control without the beetles to keep them in check. Earl proposes spraying the planet with defoliant, which causes the destruction of the vines, but also kills off all plant life on the planet. B.P. Richfield assumes that the creation of clouds will bring rain, allowing the plants to grow back, and so decides to create clouds by dropping bombs in the planet's volcanoes to cause eruptions and cloud cover. The dark clouds instead cause global cooling, in the form of a gigantic cloud-cover simulating the effects of what the viewer would recognize as nuclear winter that scientists estimate would take "tens of thousands of years" to dissipate. B.P. Richfield dismisses this as a "4th quarter problem" and states that WESAYSO is currently making record-breaking profits from the cold weather selling blankets, heaters, and hot cocoa mix as the result of the "cold snap." Later, Earl apologizes to his family and Stan for his actions that led to the end of the world. Baby is assured that no matter what happens, they will always be a family. At DNN, Howard Handupme concludes his final broadcast. In the United Kingdom, the show was screened on ITV in 1992 and in reruns from 1995 to 2002 on Disney Channel. In Canada the show started airing reruns in 1992 on The Family Channel and aired them until the late 1990s; the show also aired on CHRO-TV in the early-to-mid-90's. In Australia the show started airing on the Seven Network from February 1992 through to 1995. In Ireland, in the mid-1990s, it was shown on a Sunday evening on RTÉ Two (known as network 2 back then). In 1994,it was shown in Italy on Rai 1. The first three volumes were released on VHS in December 6, 1991. On May 2, 2006, Walt Disney Studios Home Entertainment released Dinosaurs: The Complete First and Second Seasons as a four-disc DVD box set. The DVD set includes "exclusive bonus features including a never-before-seen look at the making of Dinosaurs". The complete third and fourth seasons, also a four-disc DVD set, were released May 1, 2007 with special features, including the episodes not aired on US TV. Both sets are currently available only in Region 1. On September 29, 2017, Hulu acquired the streaming rights to Dinosaurs along with fellow Disney–ABC television properties Home Improvement and Boy Meets World, in addition to fellow TGIF programs Family Matters, Full House, Hangin' with Mr. Cooper, Perfect Strangers and Step by Step. ^ "Brian Henson's Goal - Bringing 'Dinosaurs' To Tv'". Orlando Sentinel. April 20, 1991. Retrieved October 18, 2010. ^ Du Brow, Rick (February 23, 1991). "Television: The ratings success of CBS' Ed Sullivan, Mary Tyler Moore and 'All in the Family' retrospectives may doom innovative entries in the 'Twin Peaks' mode". The Los Angeles Times. Retrieved October 18, 2010. ^ "`Dinosaurs' Takes Puppetry Into The Electronic Age". Chicago Tribune. 1994-02-03. Retrieved 2010-10-18. ^ Cerone, Daniel (1991-11-17). "Primal Secrets From the World of 'Dinosaurs'". The Los Angeles Times. Retrieved 2010-10-18. ^ Kahn, Eve M. "All in the Modern Stone Age Family", The New York Times (Apr. 14, 1991). Accessed Feb. 20, 2009. ^ Grover, Ron. The Disney Touch. Homewood, IL: Business One Irwin, 1991. pp. 167-168. ^ Rosenberg, Howard (1992-02-19). "Television: ABC series sinks its teeth into witty social commentary a la 'The Simpsons' and finds its metier". The Los Angeles Times. Retrieved 2010-10-18. ^ "BBC - Comedy Guide - Dinosaurs". web.archive.org. 7 January 2005. Retrieved 16 January 2019. ^ Hatchett, Keisha (September 29, 2017). "This Is Not a Drill: Boy Meets World Is Now On Hulu". TVGuide.com. Retrieved October 2, 2017.